Oh, how I love Tinkergaten. For those of you who know me in real life, you know I actually can’t.stop.talking.about.it. I knew it would have to be the first local spotlight on the blog. Fittingly, it was also the first class my kids and I took when we moved to Brooklyn. In NYC classes for babies and toddlers are a big business. Some families pack their kids days with music, gymnastics, dance, art, sports, etc. There are so many to choose from without having to walk far from our home at all and there were even more when we lived in Manhattan. And there is a real social pressure to have your kids enrolled in as many activities as possible. But, that is the subject for another post! I’m not even sure how I stumbled upon Tinkergarten, but it was probably through Google. What is Tinkergarten, you ask? One of my favorite parts of Tinkergarten is that it is fully outside, in all kinds of weather. We’ve done Tinkergarten on a warm sunny day, a pouring rain day and a snowy day. It’s been lovely getting to know our “outdoor classroom” in all seasons. We love the mixed age grouping. Our classes have been for kids aged 0-8. It’s a truly beautiful thing to watch the older kids and younger kids work and play together. 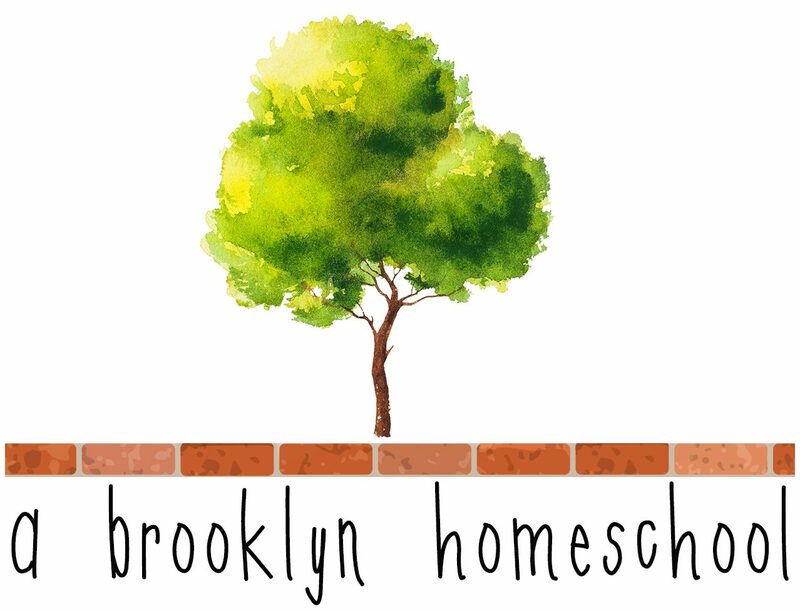 Also, if you are a homeschooler in NYC, these classes are a great place for kids age 3.5 and up who often “age out” of daytime class offerings when everyone else goes to UPK. Tinkergarten classes are designed so everyone can participate in a way that works for them. From babies, to older kids who might find their own exploring more interesting than the teacher’s planned lesson, everyone feels welcome, included and happy. My daughter took her first class as an 11 month old. I thought she’d just be tagging along with her older brother but she got right in there and joined in on everything! At a recent class, the kids found a huge tree branch that had fallen off a tree. Instead of eating snack on the class tarp as we usually do, our teacher encouraged the class to stay in the tree and eat their snack there! We love the Tinkergarten teachers! We’ve taken classes with 3 different teachers and they have all been truly wonderful. This is not something I have experienced with many other kid’s classes – that you love ALL of the teachers you’ve met. These classes are truly developmentally appropriate. I once ran screaming from a kid’s music class that involved an electric guitar plugged into an amp, a disco ball AND bubbles. Cue the extreme overstimulation from sensory overload. Tinkergarten is just what kids need – peaceful time in nature, sensory and play based experiences led by a loving teacher. In my opinion, it doesn’t get any better. Each week you get a follow-up email with photos and information detailing the skills (empathy, perseverance, etc.) the kids worked on in the previous session. Often part of the class includes the teacher reading a book out loud. Every book we’ve read has been great! It’s a source of inspiration of books for us to read in our own home. To be honest, Tinkergarten has changed, fundamentally, the way we play as a family and the way we structure our homeschool. It has almost, in a sense, given me permission to play outside, get messy and get out there in all kinds of weather with my kids. I never would have been led down the path to forest schooling without Tinkergarten. Do you have a Tinkergarten near you? Have you tried one? I’m curious if anyone is as Tinkergarten crazy as I am. Let me know in the comments!